You Saved Me & Me! Saved Me focuses on finding loving families for homeless pets. Our adoption program includes all breeds, sizes and ages so that everyone can find the right pet. We believe that every adoptable pet deserves a home. In many shelters pit-bulls are much less likely to find a home than other breeds simply because they are over represented. We think that is because of their present popularity as family pets. Unfortunately, the economy and other factors sometimes force people to surrender their beloved pets and pit-bulls are surrendered in higher numbers. We hope to help this vulnerable breed because we believe that every dog deserves a second chance. 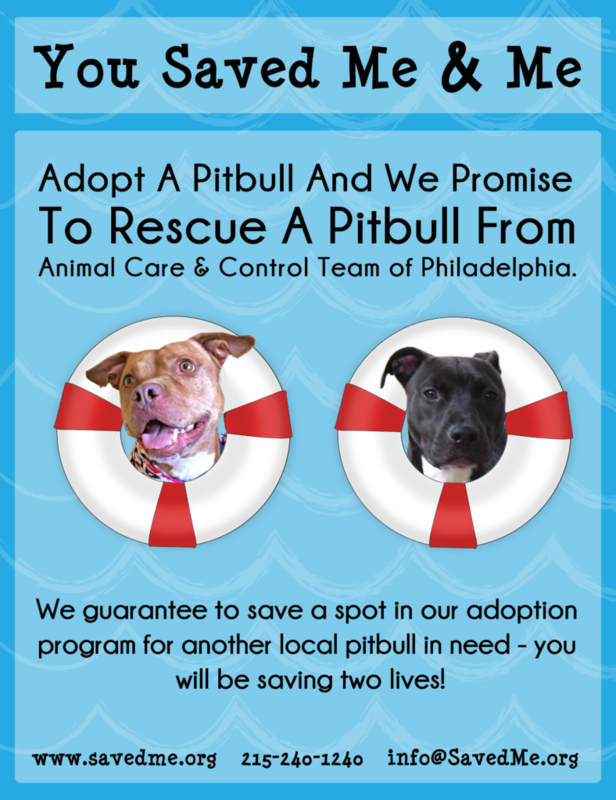 So we have decided to guarantee that every pit-bull adopted from our program means that another pit bull will take his or her place. Adoptive families will be assured that they’re saving TWO lives – the one that they welcome into their family and another pit-bull in danger. Following adoption the family will receive an email with a photograph of the dog who gets to take their new family member’s place. We hope to share that great feeling that comes when a dog goes home and we get to save another life from an overcrowded shelter. Adoption is the only way to save more pets and we hope this program inspires others to help us increase the number of dogs making it out of our city’s shelter alive. We know how much our community cares about these precious lives and want to spotlight the good that folks do when they adopt. You Saved Me & Me means more lives are saved and we are doubling the good we do for pit-bulls.